If you are a Outlook Express user, you will be glad to see that Windows Live Mail offers similar features, plus some great new ones like free access to Windows Live Hotmail and integration with other Windows Live services. Windows Live Mail is an e-mail program that you install on your PC. It connects to popular e-mail services such as Hotmail, Yahoo!, AOL, Gmail, or your ISP e-mail service and allows you to send and receive mail. Messages are stored on your PC, allowing you to access, read, and compose e-mail messages even when you’re not connected to the Internet. 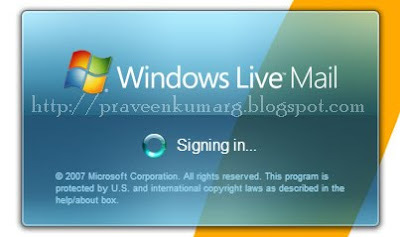 Once you connect, Windows Live Mail Beta will send and receive messages and update your accounts. Access multiple e-mail accounts in one place. Drag, drop, and organize with one click. Compose and manage e-mail even while you’re offline-when you next connect to the Internet, Windows Live Mail will automatically send and receive messages for you. Integrated Windows Live services let you launch Messenger right from Mail, and go to Windows Live Spaces with a single click. Photo E-mail lets you create and send slide shows to friends and family. All-new, cleaner, easier-to-use interface supports Aero on Vista. RSS feeds and newsgroup messages are displayed next to your e-mail, and you can search them from within Windows Live Mail. Get powerful virus scanning on all of your Hotmail messages. Enjoy increased protection from phishing scams, across all your e-mail accounts. Block suspicious messages-and senders, too. Destroy junk e-mail with a single click. Color-coded messages help you quickly identify suspicious and safe e-mail.